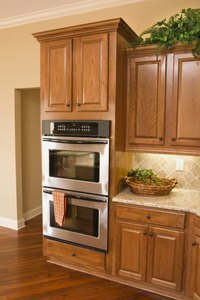 What Is the Difference Between Partial & Full Overlay Cabinets? Cabinets for kitchens and bathrooms come in a wide range of styles, shapes and materials to match various decors and accommodate homeowners' different budgets. Both manufactured and custom-design cabinets have doors with either partial or full overlays, which refers to how much of the face frame is visible when the cabinet door is closed. Partial overlay doors are the most common style in manufactured cabinets. They are easy to mass-produce because the tolerances don’t need to be exact and they can be installed with standard or hidden hinges. When the door is closed, about one inch of the cabinet frame is visible. Be wary of partial overlay cabinets marketed as custom-made, as most custom-built cabinets have full overlay doors. A full overlay cabinet door completely covers the face of the cabinet box and is commonly used on frameless or European-style cabinets. The reveal, or the exposed cabinet face, is less than 1/8 inches. Full overlays are typically found on custom-made cabinets and give the cabinetmaker leeway to conceal less-than-perfect cabinet box edges. To complete the sleek look of full overlay cabinets, concealed hinges are used. Inset cabinet doors, the only style made before 1930, are totally contained by the cabinet box frame, exposing the entire face of the frame. There is usually a 3/6-inch space between the door’s edge and the opening in the cabinet box to facilitate easy opening and closing, even if the wood expands over time. Lipped cabinet doors, prevalent in the 1940s and 1950s when cabinets were still handmade, have a groove cut into the entire perimeter of the facing behind the door, letting the door rest in place around the edges while the bottom is supported by the cabinet frame. Tambour cabinet doors have intricate designs that include a flexible backing sheet attached the cabinet body that operates on a track like a window shade and can be moved up and down. In addition to choosing cabinet door styles, you have to consider other options such as shape and materials. Common door shape choices include recessed panels, raised wood or slabs. Recessed panel doors have pushed back surfaces in the middle; this style complements modern decor. Raised wood doors are a more classical design and have raised arched, square or cathedral panels on the surface. Slab doors are flat and impart a rustic, country look to the cabinets. Typical cabinet materials include wood veneer and solid wood, the latter of which can be stained, painted or covered with plastic laminate or polyester coatings. Ultramodern kitchen designs frequently include stainless steel cabinets.